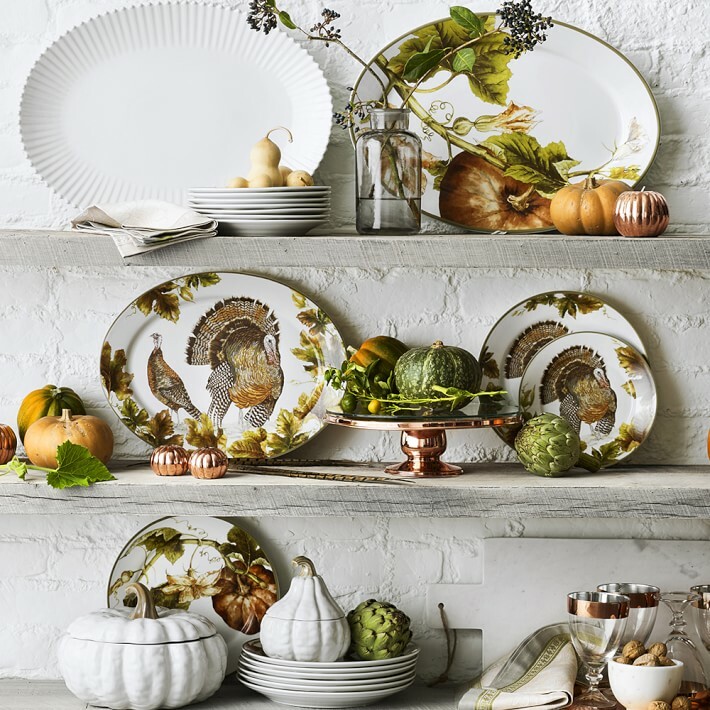 Turkey Plate Displays and a SALE! 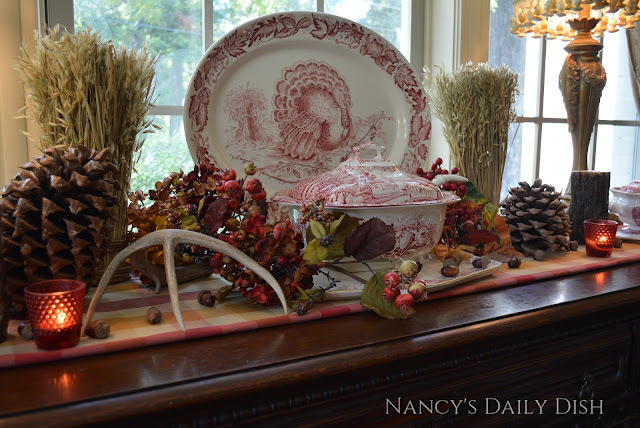 I'm sharing a few displays with turkey themed plates and platters. And, did I mention they are all on sale in my shop right now? It's time to gobble up the savings! Click HERE to visit my shop, and SAVE 20% when you use the code TURKEY at checkout! I took this pic below last year. The things we do to get a picture! I carried several big stacks of turkey plates and platters out to my front yard and laid them out on the fallen leaves (not yet raked, or when I'm real lucky blown down the street...hehe..). I dragged a ladder out there and climbed upon it with camera in hand and after several goings up and down the ladder and to and from my computer to download images I finally got a decent pic. The older I get the more scared of climbing a ladder I get! I can tell you I got some real strange looks from the passers by! Anyway, some of these have sold but there are lots more and many of the same ones in my shop. 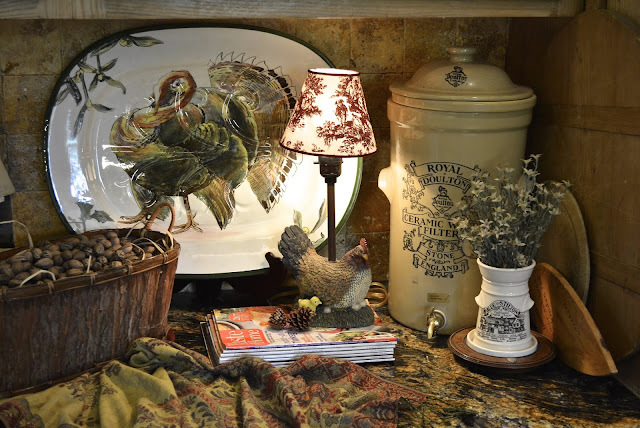 This was a display with a Clarice Cliff turkey platter I did a few years ago. 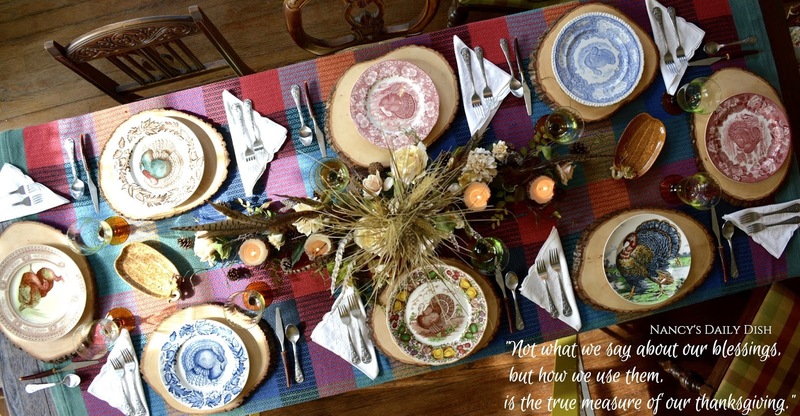 Sometimes I have trouble deciding things, like what turkey plates to set the table with. 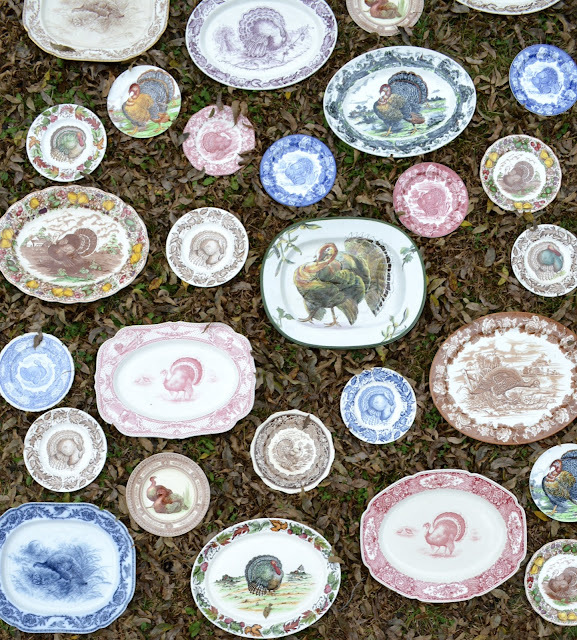 Have you ever seen 200+ turkey plates and platters amassed together at once? I bet not! 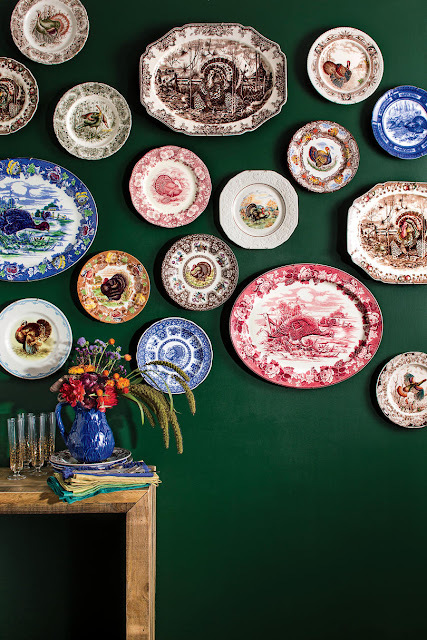 This display is the collection of Helen Gleason who collected them for over 30 years. 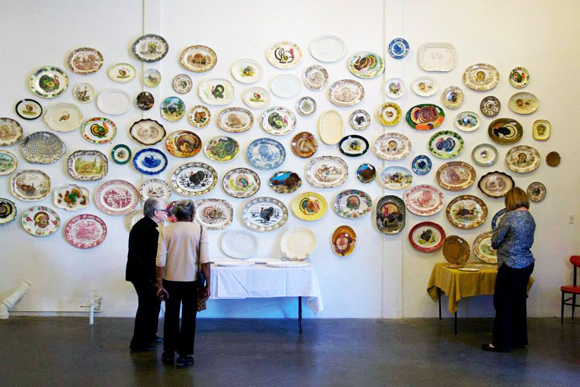 They were set up at the Red Pipe Gallery by her son for a temporary Turkey Platter Museum in 2015. What a collection! Below is a platter I've always displayed in my kitchen throughout the Fall. It's one of my favorites ever. I decided to put it up for sale as I found another one in the same pattern with a slightly scalloped border. 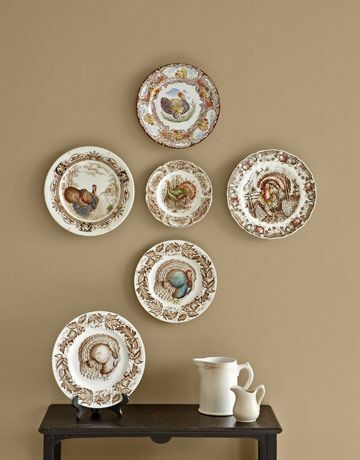 This is a very rare one by Royal Doulton with the holly leaves...plus it's a tree and well (meat platter). 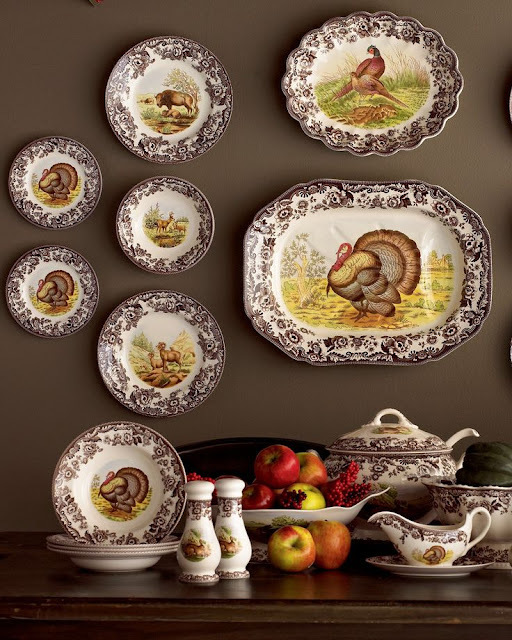 Do you have a special turkey platter or plate collection you use for Thanksgiving dinner? I have a set of Royal Doulton turkey plates that look gorgeous with my Rural Scenes pieces....but I'm thinking of selling some of them and collecting a big mix and match set....hmmmm...decisions, decisions.